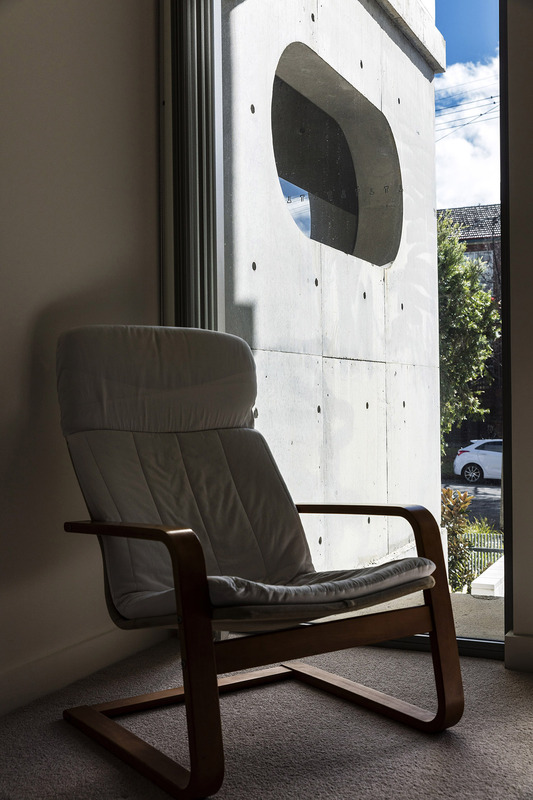 The qualities that make concrete great - its durability, sustainability, fluidity and raw beauty – are demonstrated to the full on the President Avenue apartments. “Concrete is raw and real. It is as you see it – which is lovely, isn’t it?” says Angelo Candalepas, Candalepas Associates. The President Avenue project was nearly eight years in the making for architects Candalepas Associates and builder/developers Cuzeno, but the result has indeed been worthwhile. Completed in 2016, it comprises 49 one, two and three-bedroom apartments spread over six levels. The design was originally more horizontal and bedded down into the landscape, but during the development phase Council granted approval for additional levels. Rather than replicate the existing design and create something massive and inappropriate to the site, architect Angelo Candalepas argued for just one additional level and a redesign. The result is what you now see - a building that is articulated deeply into its mass with vertical ‘grooves’, creating the impression of six separate, vertical concrete-framed blocks standing side-by-side. The scale and context is just right – neither overbearing or underwhelming. 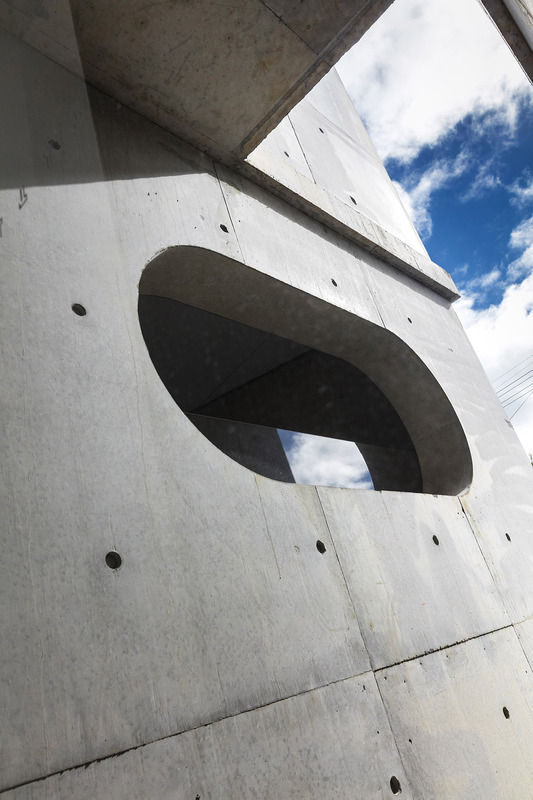 As a building material, concrete was a natural choice on a number of fronts. Firstly, from a practical standpoint, it offers superior fire performance. Of all building materials, concrete is unmatched in terms of its fire resistance. Apart from being non-combustible, it emits no toxic fumes when exposed to fire and has a slow rate of heat transfer. Coupled with that, its mass helps reduce noise transmission – an important consideration for apartment dwellers. Whole-of –life performance is also a major plus. In choosing construction materials, Candalepas’ baseline position is that although all buildings are, in themselves, finite, the materials must have a long-life - at least 50 years. Concrete, of course, far exceeds those expectations. In fact, when measured against the most common sustainability criteria - environmental responsibility, social benefit and economic viability - it’s hard to beat. Concrete’s excellent thermal properties will result in lower energy heating and cooling costs across the life of the building, more than offsetting the emissions early in the production cycle. And at the end of that life, the material is fully recyclable. Over the course of this long life, a concrete building offers another important advantage – low maintenance. Very little, if anything, needs to be done (or spent) to maintain a concrete structure. It is inherently strong and durable. “Apartment buyers are naturally very wary about strata fees and sinking funds. Using low-maintenance materials can represent a major, long-term cost saving for owners,” Candalepas says. Strong bones are one thing; growing old gracefully is another. For Candalepas, the latter quality is very important and one of the main reasons he loves working with concrete. His fundamental design philosophy is driven not by cost but by engagement – engagement with the client, with the immediate environment of the building, and with the world at large. “We’re interested in life and living things,” he says. “It’s extremely important to me that a building weathers from the very beginning, so by the end of its life it looks like a graceful old person with an understanding of everything that’s gone before it. “This gives it a quality that is endearing to people. As they walk past, they can see they need to care for and about it. “Other buildings lie to you – they try and tell you they’re going to be there forever. Yet everything looks the same in 10 years’ time, so people don’t have affection for them. “In the case of this project, every time you go there it will be a different experience. If it’s rained, or if some other environmental factor has affected the surface of the material, it’s changed it. Another reason behind the choice of concrete for this project is its design flexibility – its ability to be formed and shaped to deliver a huge range of structural and aesthetic outcomes. 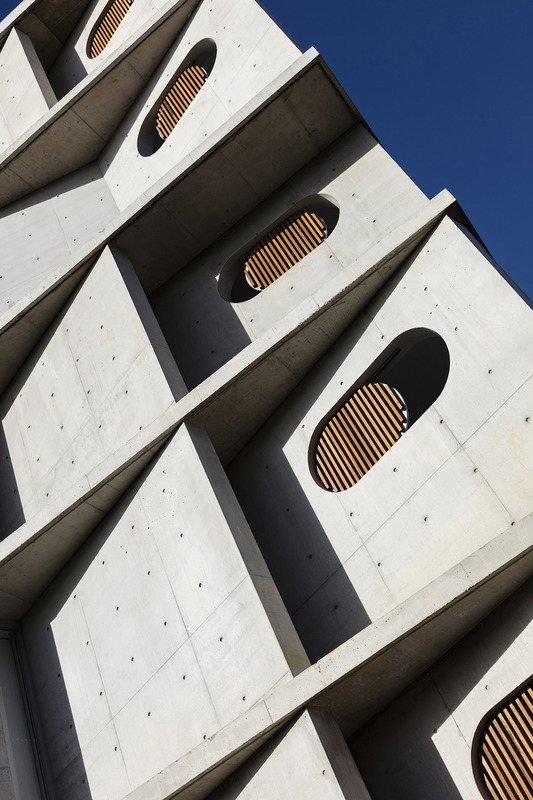 For a material renowned for its solid mass, it’s easy to forget that concrete is essentially fluid in nature. In its wet state, it is poured into moulds - either off-site or on - to define its final, hardened shape. These shapes can encompass everything from hard straight edges to rounded forms. The form work into which the concrete is poured also defines the surface look and feel. Again, the possibilities are almost limitless, from intricate, sculptural patterns to raw natural textures. “Concrete has great plastic qualities, and the playfulness this affords should be represented in the work,” Candalepas says. Nowhere is this plasticity and design flexibility more evident than on the northern frontage of the Sutherland development, where the structural concrete floor and wall elements are complemented by off-form, angled concrete blade walls that serve to screen light from the balconies. 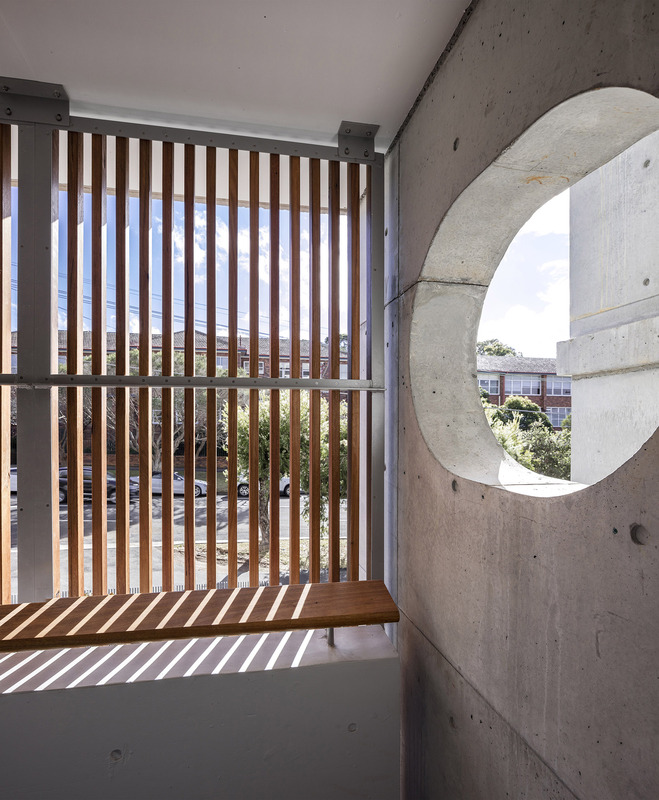 The mass of the concrete is balanced by sliding timber screens and timber handrails on the balcony balustrades. At the north-west corner, where the development folds around into Merton Street, the angular concrete balcony end-walls are punctuated by oval cut-outs that admit light and air, and defined at the corners by sharp (rather than chamfered) edges. As the sun moves along its northerly track, the play of shadows on the angular concrete walls creates a shifting pattern of light and dark, adding yet another dimension to the northern façade. Close-up, the finish of these balcony walls fully exploits the plasticity of concrete in off-form application, resulting in a ‘flaws and all’ finish that adds further to the character of the concrete elements. In fact, right across the board, the project demonstrates the inherent ‘playfulness’ of concrete – not just its ability to be shaped on site into a myriad of binding forms, but its ability to tell a story. In this case, the story ‘reads’ in the impressions left behind by the joins in the timber formwork, in the capped tie-rod holes that held the formwork together, in the exposed ends of plastic bar chairs, and in the staining left behind by the release agents. “The many things that make it should be present in the end result,” says Candalepas of the concrete walls. “The tie-rods are important because they hold the timber boards together that make up the formwork, so of course you show them,” he says. The interiors of the President Avenue apartments are deliberately simple, both in form and finish. Living spaces are situated to the north and the respective kitchens and dining rooms to the south. This allows for all the units to achieve ample sunlight access but also to have the ability to be cross ventilated right through the living spaces. Of the simplicity of the layout and finish, Candalepas says people should be able to enjoy making their own interiors. “It’s so insulting to offer people your colours. They should choose their own,” he says. Another benefit of concrete is its high thermal mass. An important component of passive solar design, thermal mass refers to the ability of a material to trap and store heat, and to naturally regulate the release of that heat into the building interior (thus saving on heating and cooling costs, reducing energy consumption and contributing further to a greener footprint). Concrete also has excellent noise insulating qualities due to its high mass. In simple terms - the greater the mass of a material, the less noise transmitted. This is of particular importance in delivering comfortable and private living space in multi-residential apartments. Candalepas says concrete, both in practice and appearance, helps bring a ‘sense of quietness’ to the President Avenue apartments. He also maintains that his philosophy and approach to using concrete - to create something that, although ultimately finite, matures beautifully and gracefully over its lifetime - brings out the best in the trades who work on his projects. He says they take pride in how they approach the work because they recognise it as a lasting memorial to their skills. The President Avenue apartments have been named one of the top 10 Architectural Statements in the NSW for 2017 in the Australia By Design series, aired on Channel 10. 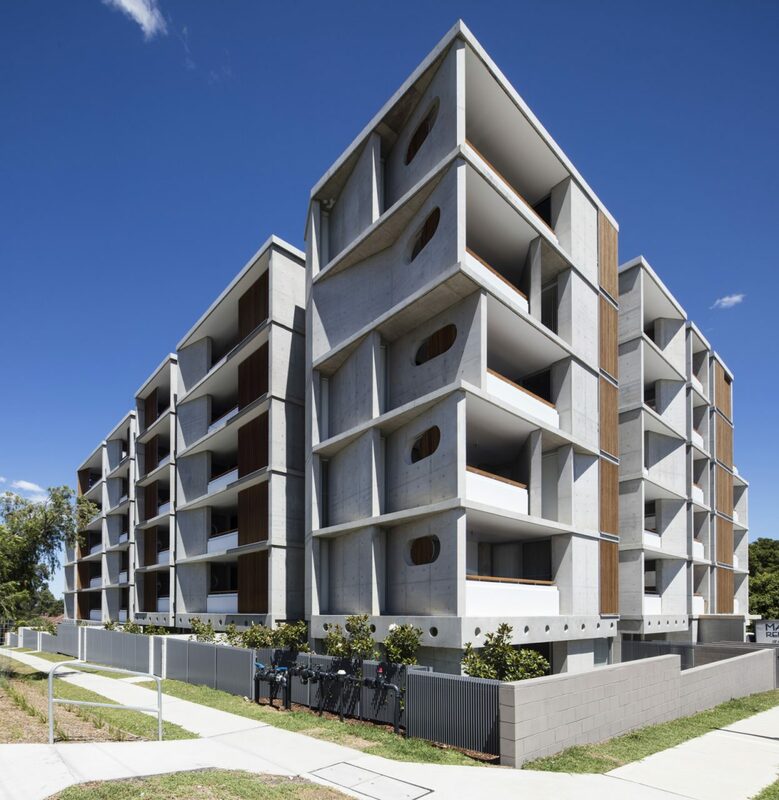 It also won the Aaron M. Bolot Award for Residential Architecture (Multiple Housing) from the Australian Institute of Architects at the 2017 NSW Architecture Awards.